People are increasingly turning to the internet for free advice on diet, wellness, and overall self-improvement, Silent Mind. Sound therapy tools like singing bowls are extremely helpful for many, and we want to make sure people are getting maximum results. Not so long ago, individuals seeking complementary or alternative medicine might have had to travel long distances to visit a provider. But with the wealth of wellness-related information on the internet today, certain self-development and life-optimization practices can be had by all at no additional cost. Diet plans. Breathing techniques. Herbal medicine. Ayurveda. Meditation. These, along with techniques like reiki and acupressure, used to be considered rather esoteric. Yet today, they’re ordinary topics seamlessly integrated into our modern lexicon - all thanks to the internet. For instance, sites like MindBodyGreen and Well + Good accrue thousands of social media engagements each and every week. Regular readers are eager to learn and share on topics like clean eating, chakra balancing, essential oils, mood remedies, and general self-care. The sheer volume of wellness content available online may be having a positive effect in some areas. While our stress levels haven’t tapered off, some populations are making decent strides in eating healthier. It’s still too early to measure the true impact, but with dietary knowledge becoming more accepted by the masses, we might be on a mission to attack stress next - and we’ll take as much free advice as our fingers can scroll through. After all, there are real socioeconomic barriers to wellness, which is likely a huge contributor to our desire to find it online. To that end, there’s also a boom occurring in the “free with purchase” arena. Companies who sell goods adjacent to the fitness/wellness industries are offering customers more for their money. The “more” is often beneficial content related to that customer’s known area of interest. Silent Mind, Amazon’s premier singing bowl seller, is one such company. While they have long offered additional content such as instructional videos and a user’s guide, they’ve recently completed development on a free mobile app, as well as five forthcoming new eBooks. 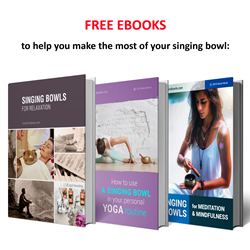 Tackling topics such as delving into sound therapy at home and using a singing bowl during a home yoga practice, they’re offering their audience free material which eliminates any chance of buyer’s remorse, all while offering real solutions for relief from modern problems like stress and anxiety. The fitness, nutrition, and wellness industries are still collectively worth $1.3 trillion dollars, so there are - as of right now - few worries that professionals are getting the shaft financially because of the internet. In fact, many are moving online, and you can expect that many will be offering bonus content with their online sessions. It’s all part of the new landscape at which we can feel better - at no additional cost.